ELECTRONIC dance music failed to conquer the pop charts in the late '90s, but may yet have the last laugh as the preferred medium for global pop-music innovation. Techno now takes the place of rock and hip-hop as the universal link, offering a template for hybrid sounds of modern culture that can be heard worldwide on TV commercials, at underground raves, and throughout current rock and R&B hits. Latin music has also recently entranced the world-pop ear. In California, a Rock en Español movement has generated moderate heat in recent years. So it's no surprise to hear a dance disc like The Tijuana Sessions, Vol. 1 (Palm Pictures), by Nortec Collective, a batch of tracks that stews feisty regional border sounds with hip club-culture groove, all by young artists from a city most Americans only associate with cheap tourism and tequila hangovers. The disc's jacket boasts the accurate claim that "Nortec Collective is not a genre or a group . . . but an entire electronic aesthetic. Nortec stands for norteno-techno; Tech-Mex cut and paste; the convergence of high-tech, low-tech, and traditional northern Mexican music." Simply put, this is techno-meets-mariachi/salsa. In recent world-pop terms, the nearest precedent is the 1997 British compilation Anokha, a disc featuring artists like Talvin Singh and State of Bengal, who spiced current dance tracks with traditional sounds from India. If you're imagining Moby remixing Herb Alpert and the Tijuana Brass, you're close. 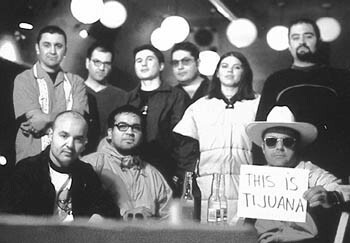 The Tijuana Sessions, Vol. 1 swings from straight house-disco hardness to semi-acoustic trance ambiance to electro-soul, hitting a smooth blend between cheap, earthy localism and sophisticated electronica. The peppy rhythms of salsa, reggae, rhumba, and bossa nova dominate the collection, with dusty samples of instruments like the cowbell, accordion, timbal, and tuba fleshing out the break beats in the same way sitar and tabla completed Anokha. For the Nortec Collective artists, blending natural sounds with modern tracks is all about fills--the space between beats where a trumpet lick kicks in some fire, where scratchy percussion maintains the pulse, where accordion chords mimic Euro-pop. Techno's favored drum-'n'-bass model is echoed with rumbling congas and timbal loops playing a consistent high to the dublike low of blaring tubas and seemingly broken, rather jazzy synth riffs. Hip culture aside, the Nortec Collective is accessible as hell. Fussible (the performing name of disc producers Pepe Mogt and Jorge Ruiz) offer the spacey influence of Kraftwerk, plus a jamming synth-funk solo on "Casino Soul." Bostich and Terrestre could be Stereolab as they navigate through their busy, soundtrack-ready, Brazilian- flavored lounge-funk. Plankton Man plays Reggae Floyd with a smooth jazz guitar solo on "No Liazi Jaz." While Terrestre's tellingly titled "Norteno de Janeiro" showcases the disc's melding of electro-pop with Latin/Caribbean roots, it's Hiperboreal's "Tijuana for Dummies" that makes the most sense. Sparse and thumping, it projects an earthiness that's easier and deeper than the jazz sax fills, Euro-beats, and the disc's single diva vocal sample. On The Tijuana Sessions, Vol. 1, those elements are all understated examples of the familiar, specific roots that Nortec Collective shares with a growing, global electronic style. From the May 3-9, 2001 issue of the Northern California Bohemian.